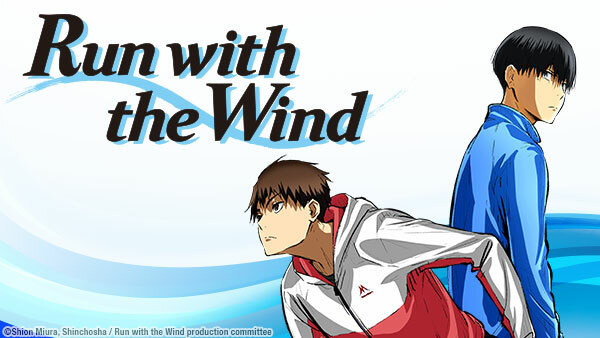 Sign up now to stream Run with the Wind, subs, tons of dubs, OVA's, simulcasts, plus the all new Dubcast℠ editions and more! Somewhere, somehow, what was once impossible became possible. The team’s confidence soars as everything starts falling into place. The last thing Kakeru expects when he shoplifts food is to be enthusiastically asked by his pursuer if he enjoys running. The others want no part in Haiji’s plan. But Haiji has a few tricks up his sleeve, which are perseverance and cunning. Perhaps he can “convince” them after all? Haiji believes everyone will be ready in time with enough practice. Kakeru claims that amateurs are no match for runners who train rigorously every day. Who is right? Kakeru runs into a person from his past, which drags unpleasant memories back to the surface. What does Sakaki mean by “must be nice having some new friends”? Most are now in agreement: They will compete in the Hakone Ekiden. To do so means qualifying with official times at track meets. Their training intensifies. It’s hard enough finding a job but being told you shouldn’t because everyone needs to focus on training? King’s had enough. There’s more important things to worry about. Their first official meet has finally arrived, and there can be no more speculation. Has idealism and training paid off or will reality prove how far they have yet to go? The results are in, and Kakeru’s frustration threatens to boil over. He and Akihiro vow to do better. Meanwhile, others find encouragement in their own ways. Prince is the weakest link, and Kakeru wants him off the team if his time doesn’t improve by the next meet. As the team’s heart, Haiji offers much-needed encouragement. With Haiji down for the count, the team delegates roles. Who will be the substitute captain, and can Kakaru and Prince meet each other halfway? Musa and the twins finally qualify for an official record. As they celebrate, others worry about their times. Fortunately, everyone has the potential to be a runner. Their story has caught the attention of an interested third party. Later, what lies in store for the team when they leave for a summer training camp? You cannot run from the past; it will always catch up. With their goal achieved, the qualifier is next. Others rally around the team and offer support. The chance for a TV interview is cause for celebration, but Yuki has doubts. Every runner in this race has sacrificed for the chance at the same dream. But the reality is that only ten out of the forty-nine teams here can move on to Hakone Ekiden. It’s one thing to qualify, but an entirely different thing to actually win. The twins point out that victory is impossible with their current times. So why try? There are times when people have unsolicited opinions. There are times when it will seem like things conspire against you. But the secret to running is attitude. All of their hard work has come down to this moment: The Hakone Ekiden has begun. While Prince recalls sage advice, Musa finds himself drawing attention. The Hakone Eikden continues with the twins coming to a realization about Hana. Shindo’s turn is approaching, and he’s running even while sick. Will this cost Kansei the race? Kensei University is falling behind. If that wasn’t enough, it's started snowing. Yuki and Nico certainly have their work cut out for them. During the race, King contemplates his relationships with others. As he awaits his turn, Kakeru discusses Kazuma with Haiji. Kensei is in 12th place but aims to make it to the Top 10… now it's all up to Haiji. May the wind always be at your back.